Proven Techniques to Avoid 5 Common Advanced Exam Mistakes and How to Score 100% on Your Exam! Exams can seem overwhelming so it is very important to know how to prepare for them and what mistakes to avoid. you are now ready to prepare for your Advanced Theory Exam. So here are your success tips on how to avoid common mistakes and how to Score 100% on your Advanced Theory Exam! Common Advanced Exam Mistakes #1: Not sure HOW to write an exam. One way to prepare is by doing mock exams. When doing mock exams, create the same scenario as an actual exam. Set a specific date and time of when the exam starts. Begin and end the practice exam on time. The Advanced Exam must be completed in 2 hours (be sure to check your work). Download your FREE Advanced Rudiments Practice Exam! Download your FREE Advanced Exam Answers for easy marking! Common Advanced Exam Mistakes #2: Don't know WHERE to begin. Before beginning the exam, take a blank piece of paper and write out the UMT Advanced Chart. This includes writing out the Circle of Fifths. Use this to check the Key Signature for the Major and minor keys when completing questions. On the last page of the exam will be a piece of staff paper. You are allowed to remove this page from the exam so that it can be used as a reference during the exam. (It will need to be placed in the envelope with the completed Examination when handing in the Exam.) Write out the Key Signatures with 7 sharps and 7 flats in the Treble, Bass, Alto and Tenor Clefs. Common Advanced Exam Mistakes #3: Didn't UNDERSTAND the question. Read the instructions. This is so important that I am going to say it again, READ the instructions. Common Advanced Exam Mistakes #4: Get CONFUSED when adding rests, bar lines or Time Signatures to a given rhythm. Before beginning the question, write the Basic Beat and Pulse below each measure. And YES you are allowed to write the Basic Beat and Pulse, to show your scoops, to add the Plus and Tilde Signs directly on your examination. So, are you in Simple or Compound Time? (Simple Time does not use dotted rests. Compound Time does use dotted rests.) When adding rests, use the Plus (+) sign to JOIN the Strong + weak or Medium + weak pluses and use the Tilde (~) sign to NOT join the weak ~ weak or weak ~ Medium pulses. Using the UMT innovative + and ~ symbols guarantees understanding of pulse and rest placement. Common Advanced Exam Mistakes #5: Forget to CHECK the examination after completion. Write out your "Handy 5 Point Check List" before beginning the exam and then be sure to check the exam before handing it in. Check that ALL the questions are answered both front and back of each page. Check the technical degree names and their roman numerals. When identifying degrees of notes, triads or cadences, determine the Tonic note first. Check the exam with a final glance to be sure answers are written clearly and neatly. 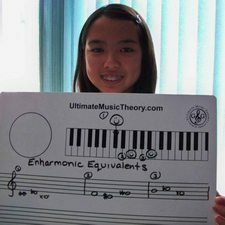 Bonus UMT Tip: Don't forget to use your Ultimate Whiteboard to help reinforce the association between the Keys on the Keyboard and the Notes on the Staff. 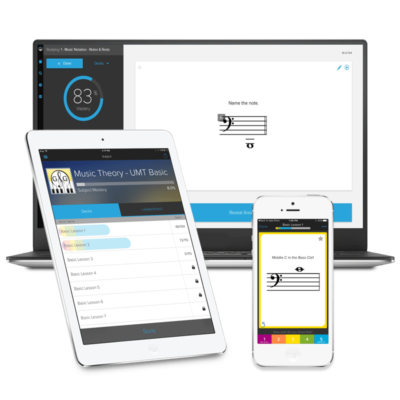 The Ultimate Whiteboard was designed as the perfect learning tool for drawing the Circle of Fifths, Key Signatures, Time Signature, Scales, Cadences, Chords, Ledger Lines and association with the placement of notes on the staff to keys on the keyboard. Ivy used her whiteboard to prepare for the Advanced Rudiments Exam. 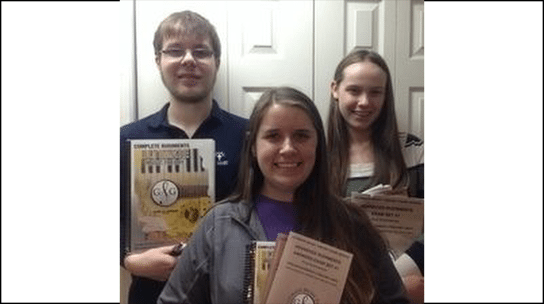 Ivy also used the Ultimate Music Theory Exam Series to prepare for her Advanced exam and she scored 100%! When you Score 100% on your exam (and YES you can!) be sure to register for the 100 Percent Club Certificate! Common Advanced Exam Mistakes - Avoid them by doing the UMT Advanced Exam Sets! Check out the Teacher Exam Pack - includes: Preparatory, Basic, Intermediate and Advanced Rudiments levels. Each Exam Set #1 and Set #2 has Four Examinations in each. These practice exams cover all the requirements for the Royal Conservatory of Music Theory Examinations. Mark your Exams using the matching Exam Answer Book. P.S. What common exam mistakes have you found and what tips do you have to avoid them? Thanks for sharing below.